I haven't seen anybody asking this. 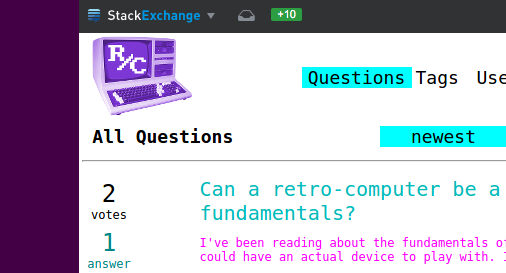 I just went to check some statistics about the Retrocomputing site and one of them featured a cloud of StackExchange sites, each one with its logo with a size relative to the size of the community. Of course, RC is still small, and it currently wears the default speech ballon logo. So is there a defined procedure to design/propose a logo for the site? Has the site to reach a specific size? How does all this work? This is question 6 of the seven essential meta questions of every beta. I get the impression Stack Exchange (the company) takes care of it, but if we come up with our own exceptional site design and/or logo, they'd use that instead. A site only gets its own look-and-feel when it exits beta though, and that can take a very long time. While it is true that no site gets an official logo or theme until it is graduated, there is another way for the enthusiastic. Over on the Anime & Manga site, they have taken matters into their own hand. This site has started the process of graduation but hasn't completed it yet. Remember that graduation takes a while, it isn't an instant pressing of a button by the SE staff. So, if you wish to create your own, unofficial, appearance for the site, you may wish to have a look. Let us know how you get on. Well, as i want to stay here for a little longer, i've decided to waste 10 minutes and contribute a little bit. I know, i know. The text looks terrible on a solid white background, but it'll look awesome once the background is something else. 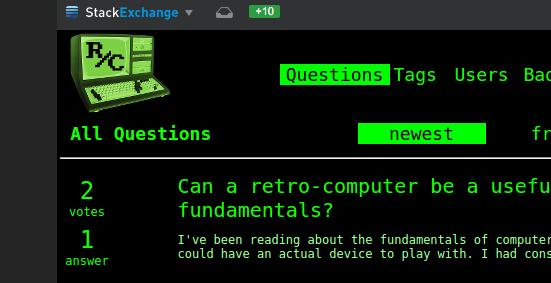 As I currently have some more free time to spare, I'm going to do a little CSS theme tweak. Once it will be ready, I'll probably post it in right here. They're not "done" by any means; I was just doing some brainstorming. And since the original question was about logos, I spent some time GIMPing (as opposed to "Photoshopping") an old image of a TRS-80 model 4 to get the logo that I used. I'm a bit unease with using a specific computer or computer style as a logo, as this feels less inclusive. I'd rather live with the RC badge than go that way. One Idea might be using a classic floppy (8"/5.25") style icon, as that's something still recognizable by todays viewers as well as beeing something truly retro. We all started when Floppies where still floppy didn't we? It's not only classic, but also quite simple in shape, thus easy to scale. By using only 1 (2) colours, it can be integrated ino next to any colour scheme. Ofc, this can be much improved using more different colours/grayscale - and maybe even droping the text in favour for just lines - like 8" labels had.